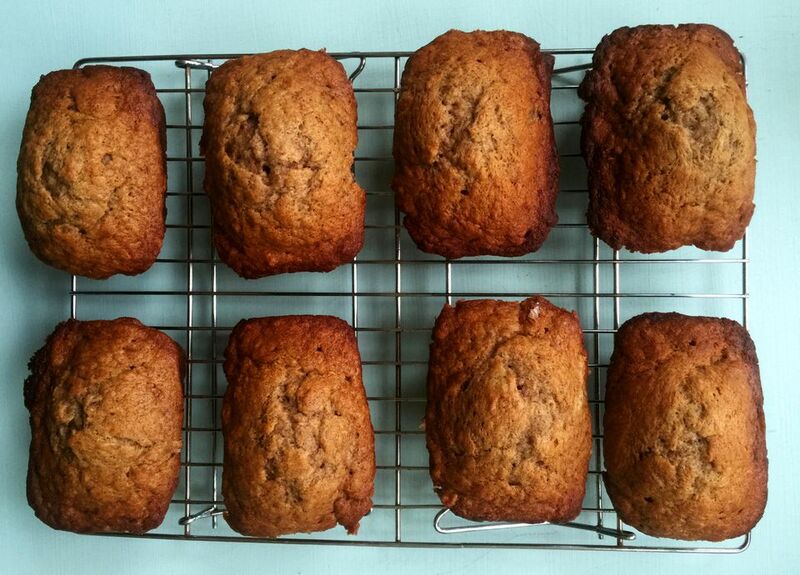 Because I find myself with overripe bananas pretty much every other week, our family eats a lot of banana bread. The freezer has also become sort of a halfway house for wayward over-ripened bananas. This version has a nice pop of cinnamon, and a lot of banana flavor. Preheat the oven to 350 F. Grease or spray 8 mini loaf pans (3 x 5-inch) or (2 1/2 x 4-inch). In a small bowl, mix together the flour, baking soda, salt, and cinnamon. In a large bowl with an electric mixer, beat the butter and sugar until light and fluffy, about 2 minutes. Beat in the eggs one at a time, then add the vanilla. Blend in the mashed bananas and buttermilk. Add the flour mixture in batches to the batter, mixing on low speed just until each addition is incorporated. At the end the batter should be barely blended (it will be thick). Scoop the mixture into the loaf pans. Bake until a toothpick or wooden skewer inserted in the middle comes out clean, 20 to 25 minutes. Cool in the pan on a wire rack for 10 minutes, then turn the loaves out of the pan and finishing cooling the breads upright on the wire rack. What Are Some Easy Dinner Roll Recipes to Make With Holiday Dinner?